It's been a beautiful start to the weekend as there almost no clouds in the sky, with temperatures only reaching the upper 60's to low 70's across the Stateline area. We keep the clear skies this evening, but temperatures will cool quickly and you'll need a light jacket again as we'll hit the upper 50's around 8pm. Temperatures will be in the low to mid 40's during the overnight tonight, and we could see some patchy fog early tomorrow morning. The end of the weekend is looking to be wonderful with partly cloudy skies and temperatures in the low 70's for Sunday afternoon. Afterwards, temperatures will start to warm up again going into the work week, as a low pressure system will develop out in the plains and bring some warm air into our area. Luckily, the summer heat is only expected to last one day, which will be on Tuesday as highs will get into the mid 80's. That low pressure system will bring a cold front through our area during Tuesday night, bringing some rain during the overnight. After the front moves out we'll see our temperatures dip back down into the 70's for the rest of the week. We have a few rain chances next week to start out the month of October. Another low pressure system will move in at the end of next week, and bring us some more rain in addition to the rain on Tuesday. This is great news for us because we're in desperate need for rain. We built a huge deficit this month, only seeing half an inch of rain, when we were supposed to see over 3 inches of rain. The U.S. Drought Monitor has us classified as abnormally dry, with areas of Boone, McHenry, and Walworth counties being classified as Moderately Dry. Even though we're in quite a deficit, the start of October will point us in the right direction. What a perfect way to end the work week, partly cloudy with temperatures in the upper 60's! We finally got that Fall weather we've been waiting for, and the evening will be just as nice, but those temperatures will cool off quickly so be sure to bring a light jacket with you when going out tonight. Also, get ready for the coldest night of the Fall season so far as we'll dip into the low 40's during the overnight, and a few locations very well could see the upper 30's. This quick drop in temperatures may also bring some light fog early tomorrow morning. The Fall-like weather is looking to stay with us going into the weekend as we'll have sunshine with temperatures in the upper 60's to low 70's Saturday afternoon. Sunday will be similar, just a few more clouds during the afternoon. However, enjoy the Fall weather while you can because the summer heat isn't quite done with us yet. Temperatures will begin to warm up heading into the work week, hitting their warmest by the time we get to Tuesday. Here's why the heat is going to return. That high pressure system that's keeping us cool and dry is going to shift southeast, where it'll be in a better position to start pulling some warmer air into our area. By the time we get to the end of the weekend, a low pressure system is going to develop out in the plains, and will begin tracking northeast while also pulling in some warm air into our area. Low pressure systems have counter-clockwise winds around them, while high pressure systems have clockwise winds. You can imagine based on the positions of these two systems in the photo how they'll be able to pull in lots of warm air into our area. We'll hit the mid 80's on Tuesday and stay that way for a few days. However, we'll get those Fall like temperatures back to us in no-time by Friday. The latest Drought Monitor has been released by the Drought Mitigation Center, and it shows that portions of the Stateline are now in a Moderate Drought. 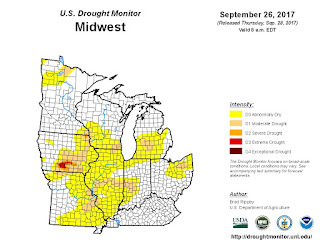 Boone and McHenry county in Illinois, and Whiteside county in Wisconsin have been placed under the moderate drought category. 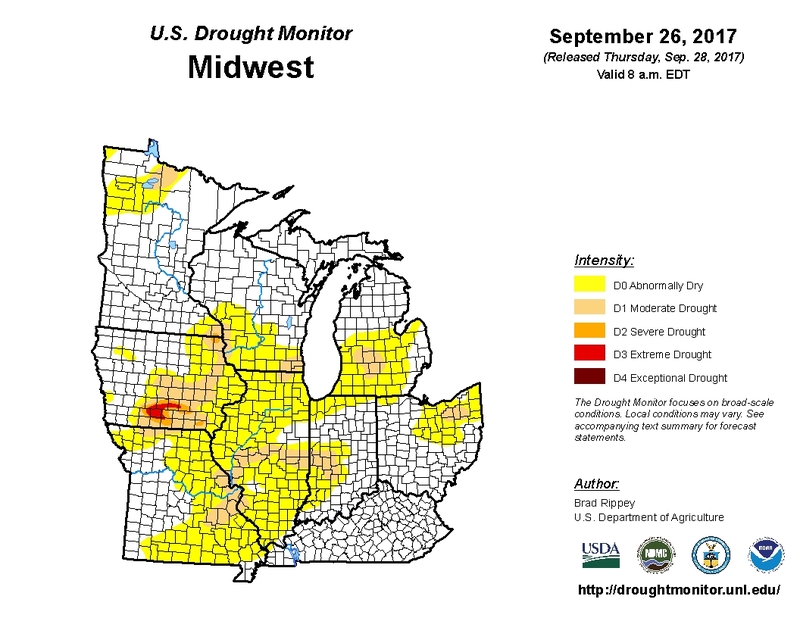 While the rest of northern Illinois and southern Wisconsin are now under 'abnormally dry' conditions. Areas with abnormally dry conditions and drought conditions have increased since last week's update; from 91.35% to 92.60% and 11.23% to 12.84% respectively across the state. This puts an estimated 914,251 people under a drought. There isn't much of a rain chance in the forecast, next chance will be potentially late Wednesday into Thursday with the passage of a cold front. However, this is over week away and models are nowhere close to an agreement on when that cold front will move through. Some models stall it west through the middle of next week, and then bring the cold front (and rain) through next weekend. It was a gorgeous day across the Stateline as temperatures got into the upper 70's to accompany the sunny skies. We're finally getting the Fall weather we've been waiting for after a 'warm' welcome last week. We do have a slight rain chance along the state line around 8pm, but other than that we stay dry this evening with temperatures cooling off pretty quickly. We'll eventually cool down to the upper 40's during the overnight tonight. We've got an even better Fall-like day tomorrow as temperatures will only be in the upper 60's, and we'll get sunny skies to go along with it again. We hang on to the Fall like weather going into the weekend, but the summer heat unfortunately isn't done with us yet. The high pressure system that'll keep our weather Fall-like going into the weekend will track east saturday night, which will put it in a position to pull some warmer air into our area. By the time we get into the beginning of next week, a low pressure system will form out west. This, along with the high, will channel warm air into our area, possibly bringing us up into the mid 80's by the time we get to Tuesday. The warm air will linger afterwards, bringing us rain chances towards the end of next week. We'll see 80° on Monday, but the summer heat will settle in after. It's good that we have a slight rain chance this evening and chances for rain at the end of next week, because we've developed quite the rain debt! We're supposed to have already seen 3 inches of rain by now this month, but we've only gotten half an inch. We're in a 2.5 inch deficit, and that's building off the deficit that was seen in August. The U.S. Drought Monitor has put us under abnormally dry conditions, with parts of Boone, McHenry, and Walworth counties classified as Moderately Dry. Obviously it'll take time before we can make up for the deficit, but the slight rain this evening up north and the rain chances at the end of next week will at least point us in the right direction. Just How Dry Has it Been This Month? We've posted a lot on the weather blog recently about the dry weather we've had through September, but just how dry is it? Well, to date for the month, there has only been 0.51" of rain that has fallen. This brings the deficit to -2.44" below where we need to be. The overall average rain by the end of the month should be 3.35", but there isn't rain in the forecast until the start of October. If the forecast stands that would keep the September total at 0.51", but where does this month stand compared to history? Looking back, there have only been five other years that have been drier than this September. This year stands as the 6th driest September on record, here's a look at the other five. If you'd like to read more on how the lack of rain has impacted farms, make sure to scroll down a bit more and check out some of our previous posts. It's been somewhat of a broken record forecast lately with a string of hot days to greet the start of Fall. From the 20th of September through the 25th of September, we've had five days in the 90's and one at 89°. The average high over the last six days is 91°, almost twenty degrees above average for this time of year. When we think about why it's been so hot, a few factors come into play. The first is the pattern of the upper level winds, or as we call them, our jet stream winds. A large trough or dip in the jet stream across the Pacific Northwest and west coast, brought a relief from the record breaking heat they experienced this summer. That in turn brought stronger winds moving from the southwest to the northeast over the Rockies. This is considered the more 'active jet' where storm development happens a little more frequently. This kept a more active pattern from the Rockies to the Northern Plains, and a reinforced ridge across the Midwest and East Coast. With the ridge and blocking high pressure system in place, temperatures were able to build and rise across the Midwest. There's another reason though, that the heat has lasted this long, and it's not something you'd expect. The multiple hurricanes in the Atlantic have actually kept the hot and humid weather in place. The multiple strong hurricanes amplified the upper level pattern, and kept it from moving east. There's one more culprit that helped the string of 90's stick around, and its actually the lack of rain that we've had. Dry ground warms more efficiently compared to saturated soil. So essentially the dry ground reinforces the dry and hot weather over the area. As you've heard, the pattern is finally starting to change, with more fall like temperatures arriving Wednesday. The previous post outlined the upcoming pattern change and the chance for rain, but unfortunately any rainfall we do receive Tuesday doesn't look to be much. And the remainder of the week looks pretty dry, too. We desperately need the rainfall because we've only received half an inch of rain during the month of September. Normally by this time in the month rainfall totals are over two and a half inches. But with the lack of rain, this has put us in over a two inch deficit. There wasn't much change in the drought monitor from last week to the previous week - with much of Illinois remaining in the abnormally dry conditions. However I wouldn't be surprised if parts of Illinois were placed under moderate drought conditions with the next issuance of the drought monitor this Thursday. The excessive rainfall hurt farmers in Spring with planting, causing many to replant their crop. Now the excessive dry weather will likely hurt farmers with overall yield of both corn and soybean. It's early in the harvesting season, but there have been some farmers out in the fields already harvesting soybeans. Typically this takes place either the second or third week in October. And if you've seen any of the combines in the fields, they are kicking up A LOT of dust. While it's never good to go into the winter months with dry soil, for corn and soybeans soil moisture can often times be made up during the spring months. For winter wheat and alfalfa, it's a bit different. This is where we need adequate moisture in the soil during the winter months. If there isn't, those crops can go into shock before Spring. Unfortunately the outlook for the next week or two doesn't look overly promising for any significant rainfall. And this may be a pattern that continues into the month of October. An upper level, amplified ridge has been in place over the Midwest for the past week or so, which have brought a string of days that made it into the 90's. Since Wednesday, September 20th through Sunday September 24th, four of those five days made it to 90° or above. The only day that didn't was Thursday, but it will still a hot afternoon with the high temperature in Rockford at 89°. Now, a developing low pressure out west will ride along the ridge and help to break it down late Tuesday into Wednesday. This will bring a more zonal flow (from west to east) aloft in the atmosphere, while at the surface a cold front will pass. This will bring a big drop in temperatures by the end of the week. But it will also bring a chance for some much needed rain, unfortunately not as much as we need. The cold front will only have minimal lift when it passes, and there isn't much instability to work with either. This brings mainly just a threat for widely scattered showers and a rumble of thunder. Timing of the front as of now will be Tuesday afternoon into the early evening, before drier air moves in Wednesday. Right now, only .10" of an inch is in the forecast for rain on Tuesday. The rest of the week remains dry, and into Sunday. Our 3rd day in a row with temperatures hitting 90° across the Stateline area, but heat index values were much lower than what they've been the past couple of days. Humidity is a little lower, but it's still fairly muggy. It'll stay fairly muggy this evening, but overall it's going to be a nice, summer-like evening with temperatures in the upper 70's to low 80's and clear skies. The clear skies will help temperatures cool off quickly, and we'll eventually dip to the mid 60's during the overnight tonight with chances for light fog early tomorrow morning. As we go into the work week, temperatures will vary across the Stateline due to cloud cover from an approaching front. We'll see more cloud cover out west, but lots of sunshine out east. This will lead to the temperature variation. We're looking to see the mid 80's out west, with temperatures around 90° possible out east. Rockford will be in the middle with partly cloudy skies and temperatures around 88°. On Tuesday, a cold front will approach from the west bringing us chances for some light rain out west during the morning, with thunderstorms expected for the afternoon. However, these thunderstorms are not expected to be severe. The front will move out during the evening, after which we'll finally get to see the fall-like weather we're supposed to be having settle in! Dry, cool air will settle in after the front moves out, bringing us sunshine for the rest of the week with temperatures gradually cooling down. We'll be in the low 70's Wednesday and Thursday, dipping to the mid 60's on Friday, before low 70's return for next weekend. The fall-like temperatures will be a huge relief, especially after having temperatures that were nearly 20° above average! However, as odd as it is, we only broke one temperature record this weekend. 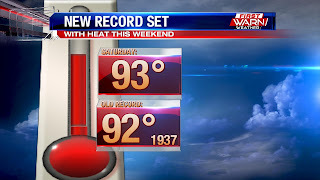 Saturday we hit 93°, which was just one degree above the previous record of 92° set back in 1937. With the cool air coming in later this week, temperature records are unlikely to be broken anytime soon. Similar Late Season Warmth Has Happened Before . . . . While unusual, it is not unprecedented for late season heat waves to occur in our area, in fact, as the graphic points out, these are 3 examples of 3 day 90+ plus runs that have occurred later in the year than we are experiencing now. It looks like we might get very close to or reach 90 degrees on Sunday, which would qualify for another 3 day stretch. After that it appears our conditions will start to change with a very gradual downturn in our high temperatures. Highs are predicted to be 88 on Monday and 84 on Tuesday before fall-like weather will return to our area. For those of us that enjoy the heat and weren't quite ready for fall - hopefully you enjoyed the experience. Although we might see short term returns to warm weather, we shouldn't experience heat like this again until next summer. Even though it was our first official day of Fall, it felt like we started a second summer season. Temperatures hit the low to mid 90's across the Stateline today, and heat index values were in the mid to upper 90's! Not exactly the warm welcome we were expecting for the start of Fall. Luckily, those temperatures will cool off quickly as we go through the evening due to the clear skies over our area. We'll see the upper 70's around 9pm, and then dip to the mid 60's during the overnight tonight. With how quickly the temperatures will cool, we may see some areas of patchy fog early tomorrow morning. A few showers and thunderstorms developed in east central Illinois during the late hours of the afternoon, and are tracking this way. However, due to the dry air mass over our region, most of these should die out by the time they get to the Stateline area, so at the most we may see some light rain in Lee and the southern portions of DeKalb counties between 7-8pm. After that, shower chance will decrease and the rest of the showers moving towards will more than likely fizzle out. Our official high for today was 92°, just one degree away 93°, which was the record set back in 1937 for September 22nd. This hasn't been the only time this year we broke a temperature record, as we hit 80° back on March 24th. It's interesting how at the start of Spring and Fall, we hit near-record breaking temperatures. Another hot day for us in the Stateline tomorrow as temperatures will hit the low 90's, with heat index values expected to be in the mid 90'. Not to mention it'll be sunny, so definitely take precaution if going outside tomorrow afternoon because the heat, humidity, and sunshine will take a toll on you quickly if you don't stay hydrated and take frequent breaks. The heat and humidity stays with us this weekend and going into next week, but on Tuesday we'll see a cold front move through and bring some thunderstorms, after which will cool to the mid 70's on Wednesday, and dip to the 60's by next Friday. Just a few more days of heat and then we'll get to finally experience more fall-like weather! The start of astronomical fall begins Friday, September 22nd, but it won't feel like it Friday afternoon. High temperatures Friday are expected to warm back into the low 90's, with overnight lows in the mid to upper 60's. We came close to our record high Wednesday afternoon and will come close to it again Friday - the record high is 92 degrees set back in 1937. The one area where we most likely will break a record temperature is for overnight lows. The record warm low temperature (warmest overnight low) is 65 degrees set back in 1959 for Friday and 66 degrees set back in 1920 for Saturday. High temperatures will remain warm through the weekend and into early next week. A strong cold front comes midweek, next week bringing highs back near normal. 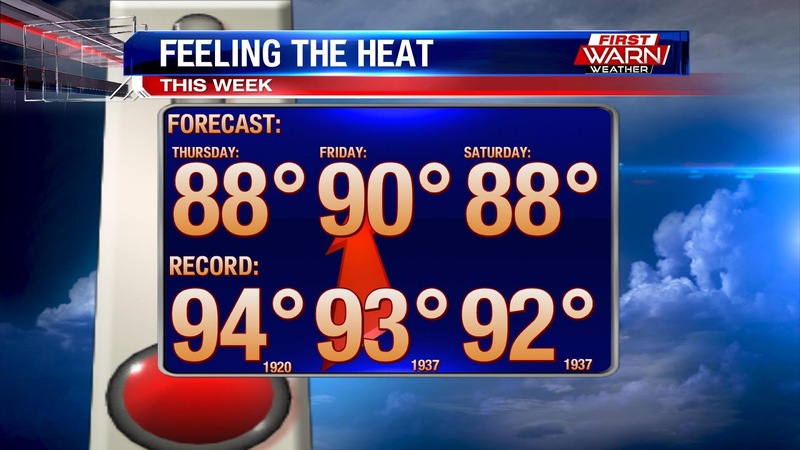 You've probably heard by now that it will be HOT this weekend, with forecast highs nearing record high temperatures. The closest we get will be Friday where the forecast high and the record high are just a degree apart! Not only that, but it will be hotter here than in a lot of southern cities! Highs will be 87° in Phoenix, 88° in Birmingham, and 89° in Miami! Only Dallas' forecast high is higher than Rockford's. Even though we are only a day away from Fall, remember that late season heat is just as dangerous as mid-summer heat. Remember to take care of your pets, and never leave kids or pets in a hot car. You'll also need to the sunscreen through the weekend, and drink plenty of water! We don't cool down until the middle of next week! Thunderstorms over eastern Iowa have had a hard time making it much past the Mississippi River Wednesday evening. There have been a few strong to severe thunderstorms to the north in Wisconsin and near the Quad Cities, mostly producing gusty winds and small hail. 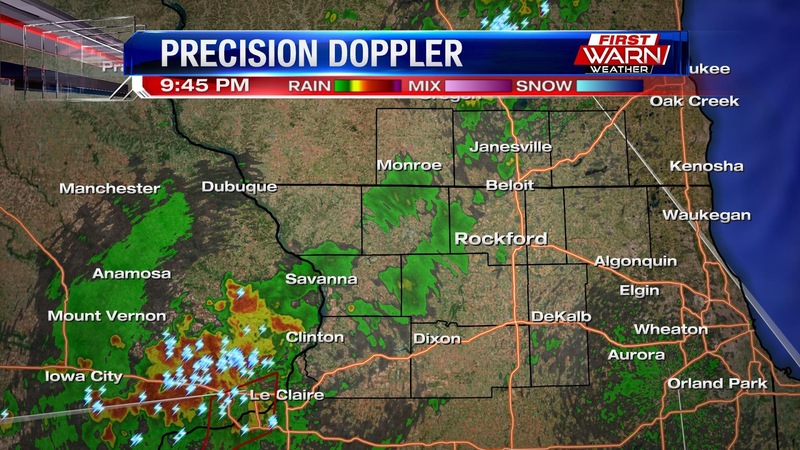 The storm complex near the Quad Cities hasn't moved much this evening, prompting Flash Flood Warnings. Radar estimates of over three inches of rain have fallen in that area. With the cold front still to our west, I do think we will see widely scattered thunderstorms overnight. But the overall coverage doesn't look too significant. The likely reason why thunderstorms have had a hard time making much progress to the east is due to a warm layer air aloft over northern Illinois. The map on the left is an analysis of temperatures and pressure at the 700mb level -roughly 10,000ft above. This is a good level to look at to help identify where temperatures may be a bit too 'warm' for air to rise to begin or sustain thunderstorms. Temperatures at or above 10 degrees Celsius usually indicate a cap, or lid, in the atmosphere. Temperatures around 10 degrees Celsius are found over northern Illinois, likely not allowing storms to the west to move east. Highs Wednesday warmed into the low 90's with the heat index reaching the mid to upper 90's, even low 100's. The official high in Rockford reached 91 degrees, just one degree off from the record high of 92 degrees set back in 1920. The last time the temperature reached 90 degrees, or above, was back on August 16th when the high was 91 degrees. High temperatures through the weekend will continue to reach 90 degrees as an unseasonably hot air mass remains in the Midwest. Dew point temperatures will also remain high with readings in the mid and upper 60's. This will push the heat index into the mid and upper 90's through the weekend. The light rain we had over northern Illinois and southern Wisconsin late Monday night and early Tuesday wasn't much, but at this point we'll take whatever we can get. The skies Tuesday will remain dry in the Stateline, but strong thunderstorms are currently moving through the northern Plains. A Tornado Watch has been issued for parts of North Dakota, South Dakota and western Minnesota, while several Severe Thunderstorm Warnings and even Tornado Warnings have been issued. 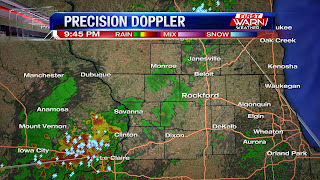 Active weather Tuesday night will remain well northwest of the Stateline. As the cold front moves east and southeast Wednesday morning, there could be a few weakening showers/storms approaching the Stateline, but I don't think those will have too much of an impact on the area. The cold front will move towards Wisconsin and Iowa late Wednesday, and eventually into northwest Illinois early Thursday. 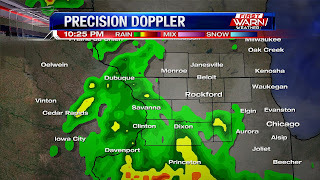 Thunderstorms are possible for the Stateline Wednesday evening and overnight. The overall severe threat is low, but a line of thunderstorms forming along and ahead of the cold front could be capable of producing gust winds. The front will be pulled back north as a warm front Thursday keeping our skies dry through the weekend. We've been talking about a changing pattern recently that will bring summer-like temperatures across the Stateline. An amplified ridge will build across the Midwest as an upper level trough digs across the west. This will put Iowa, Illinois, and Wisconsin under southwest flow aloft. This essentially transports a warm and moist air mass across the Midwest as temperatures build underneath the ridge. Temperatures by Wednesday will climb into the upper 80's and will stay there through the weekend with this amplified ridge overhead. Friday even has a shot at 90° with a little more sunshine in the forecast that day. But not only hot, it will be humid too as dew point numbers climb into the 60's and even skirting near 70°. While it will be anywhere from 10-15° above average, it doesn't look like we will break any records. Friday will be the closest to the record of 93° which was set in 1937. The records for Thursday, Friday, and Saturday were all set in the 1920's and 1930's. The ridge is forecast to start breaking down next week, which will usher in a cooler air mass. Light rain showers are trying to move into northern Illinois from the southwest, but are encountering a little more dry air. While a few light rain showers are possible later tonight, likely closer to Midnight, more of the steady rain will occur over central Illinois. Clouds are beginning to thin out back west over Iowa and this is where fog has quickly developed. It's possible that as the rain shifts east early Tuesday morning, fog may settle in around sunrise. The fog and low clouds could limit temperatures, in some spots, from warming back near 80 degrees Tuesday. 9:00pm Update: Hurricane Maria is now a Category 5 hurricane with maximum sustained winds of 160 mph. 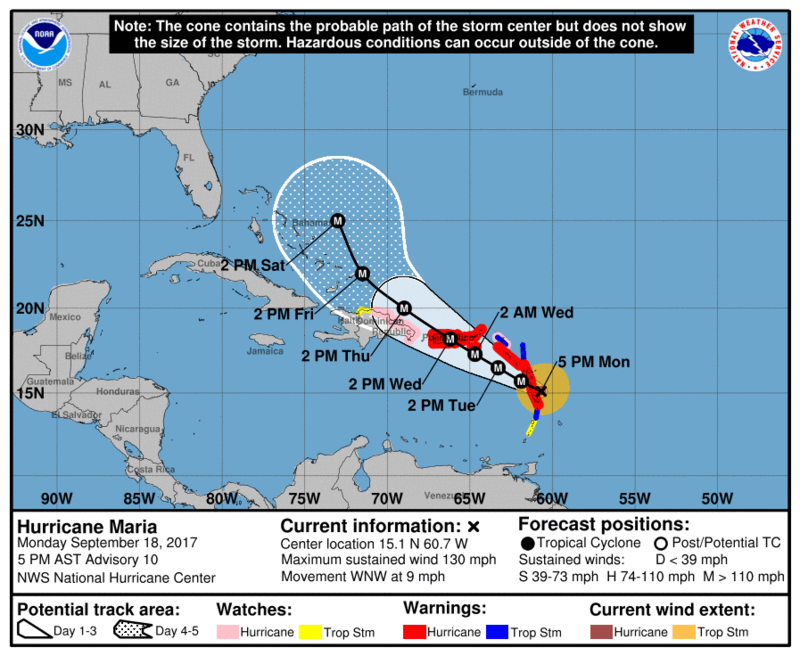 Hurricane Maria quickly strengthened from a Category 1 hurricane late Sunday evening, to a Category 4 hurricane Monday evening. Maximum sustained winds have been measured at 130 mph as the storm moves west/northwest at 9 mph. As the storm moves into a favorable environment for continued development, Maria could reach Category 5 status within the next 24 to 36 hours. In the direct path of Maria are some of the Caribbean Islands that were devastated by Hurricane Irma just less than two weeks ago. As many residents on the islands evacuated to Puerto Rico following Irma, those people may now be bracing for a direct impact as Hurricane Maria is forecast to move over Puerto Rico early Wednesday morning. Hurricane Irma moved a little north of the Puerto Rico, but still producing a significant amount of wind damage causing thousands to lose power. 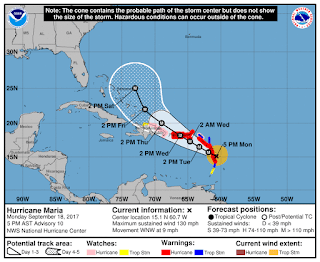 Hurricane Maria will track a little south of Irma's track, bringing the strongest winds of the hurricane through the U.S. Virgin Islands and the northern coast of Puerto Rico. Hurricane Maria will maintain its strength as steers towards Turks and Caicos and southern Bahamas by the weekend. The official start of Fall may begin later this week, but temperatures are expected to feel anything but fall-like. Highs Sunday were a little more seasonable following the passage of a cold front. Temperatures Monday will remain in the mid to upper 70's ahead of a warm front that is expected to bring quite a bit of warmth back into the Midwest. The jet stream pattern this week will be 'stuck' in a blocking pattern with high pressure centered over the Great Lakes and East, and low pressure over the West. Hurricane Jose is moving up the East Coast, and while not a direct impact on land, is still affecting the weather pattern over the lower 48. A strong ridge of high pressure won't move much to the east due to Hurricane Jose and this will continue to push temperatures well above average over much of the Midwest, Great Lakes and Southeast. Meanwhile, cooler than normal conditions are expected over the west with rain and snow. The middle of the country will remain the 'active zone' with low pressure systems developing over the southern Plains and lifting into the Upper Midwest. We will see a few showers and thunderstorms this week in northern Illinois and southern Wisconsin, but the chance for those remain isolated and low. To better understand why exactly our weather pattern has taken such a drastic change from where we started out the month, we have to look roughly 18,000 feet above our heads. The upper level pattern in the atmosphere resembles the negative phase of the Pacific North American teleconnection, or PNA. According to the Climate Prediction Center, the PNA is 'one of the most prominent modes of low-frequency variability in the Northern Hemisphere extratopics'. Basically, it has an impact on the weather that occurs over the United States and identifies where height anomalies occur in the atmosphere. Think of the atmosphere like an apartment building. Just like an apartment building has different floors, the atmosphere consists of different height levels. When the air mass over a certain region warms, that air mass expands causing the height levels over that area to rise. The opposite happens when the air mass cools. These above average and below average anomalies correlate well with what's occurring over the United States, and could explain why our temperatures are warming like they are. Heights levels the Midwest and Great Lakes have been rising above average, while falling below average out west. While the high heat might not last, the above average warmth (remember our average high by the end of the month is the low 70's) could last through the end of September. It was another gorgeous, summer-like day in the Stateline hitting the mid to upper 80's again. However, we now have some rain moving in from the west, which is why we're seeing some clouds build up on our MercyHealth Skycam out in Freeport. The rain is developing ahead of a cold front, and is moving through some of our western counties. The front will slowly make its way towards the Stateline as we go through the night, so we'll keep rain chances in play this evening out west as a few more showers could develop ahead of the front. Everywhere else will see mostly clear skies this evening with temperatures in the upper 70s to low 80s. The front will move in around 4am, by which the better rain chances out west will come into play. The front will then move further into the Stateline around 7am, giving rain chances to everyone else. By around 1pm, the front will move out and we'll have a gorgeous end to the weekend with sunshine and more mild temperatures in the upper 70's. Lots of warm air and moisture will be moving into our area as we go through the work week, which will warm our temperatures while also increasing our rain chances. Our first round of rain will come up on Monday, with thunderstorms looking to move in on Wednesday. Slight chances for a couple isolated storms Thursday and Friday, but the best rain/storm chances will be Monday and Wednesday. Tuesday we'll see drier conditions with sunshine and temperatures in the mid 80's. It's a good thing we've got a more active weather pattern coming up because we desperately need the rain. The U.S. Drought Monitor has classified northern Illinois as Abnormally Dry, which is on the lower end of the drought scale. We're building on a fairly large deficit from August and are already in a big deficit for this month, but at least these rain chance coming up will point us in the right direction. We had another gorgeous day across the Stateline, but you may have noticed something a little unusual....it was really warm! Temperatures hit the upper 80's this afternoon, 10° above our average for this time of year. Luckily, for those of you who are sick of the heat, the skies will stay clear this evening, which means our temperatures will cool off pretty quickly. We'll drop back into the upper 70's around 9pm, before cooling to the mid 60's overnight. There is some moisture flowing into our area out of the south, so we may see some light fog early tomorrow morning. We'll go into the weekend with the same weather we had today, sunshine and temperatures in the upper 80's. However, it will be fairly muggy as dew point temperatures will be in the low 60's, and a few places could see heat index values around 90°, so keep that in mind if you plan on going outside during tomorrow afternoon. Even though the weather's been gorgeous this week, it has come with a bit of a consequence....no rain! We haven't seen significant rain since August 28th, where we saw a little over 2 inches. Since then, we've been dry, and we're building on that 1.57 inch deficit from the entire month of August from the lack of rain we've seen this month. We're supposed to already have seen around 1.5 inches of rain this month, and so far we've seen under one-tenth of an inch, so we got a ways to go. Luckily, we do have a cold front on the way, and that'll be settling into our area early Sunday morning. 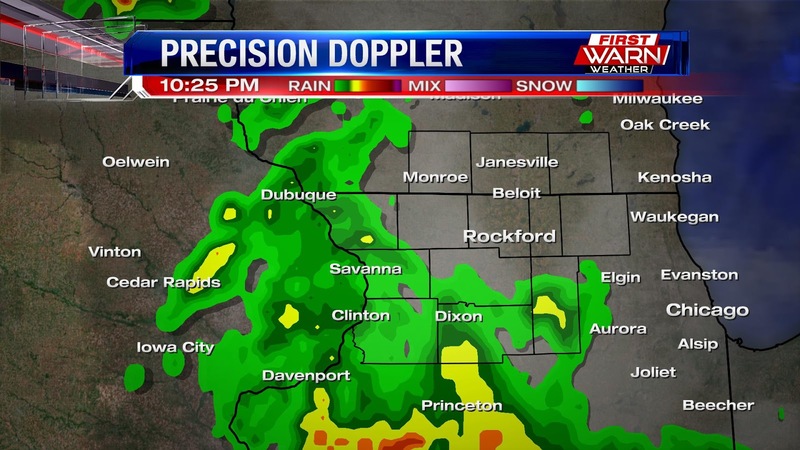 It'll bring a few showers and a couple thunderstorms across the Stateline, but only for the morning. We stay dry during the afternoon with highs in the low 80's and mostly cloudy skies. However, once we get into next week we'll have more warm air and moisture move into our area, and this will give us a few rain chances going through the work week. We'll have rain chances on Monday and Thursday, with only slight chances on Wednesday and Friday. It doesn't seem like a lot, but at least it'll be a step in the right direction. Along with those rain chances, temperatures will be in the low 80's on Monday followed by the mid 80's for the rest of the week, before slightly cooling to the low 80's by the end of the week. Ask anyone what the one downfall is to the nice stretch of weather we've had lately and they'll likely tell you it's the lack of rain. We are two weeks into the month of September and we have yet to record over a tenth of an inch of rainfall. Since the beginning of the month only 0.07 inches has fallen. August was also a dry month recording a little over three inches of rain, nearly an inch and a half short of the monthly average. The most recent drought monitor was released Thursday morning from the National Drought Mitigation Center in Nebraska. Drier than normal conditions have really expanded over the state of Illinois, with now nearly 91 percent of the state considered dry. The hardest hit area in the Midwest remains to be in Iowa where very little rain has fallen over since the beginning of August. The drought monitor is put together by a team of meteorologists and climatologists, with input from many different professionals and experts from across the country. Not only do they look at the amount of rain that has fallen over a period of time, but also other factors such as soil moisture and type, past rain events, future rain events, etc. There have been some areas of northern Illinois that dealt with exceptional rainfall in late Spring and early Summer, but since then not much rain has fallen. While I don't think the drought conditions will become a significant problem for us in Illinois, we do need fall moisture in the soil as we transition into Winter. Adequate moisture is needed come Spring for planting crops. We do have a little rain in the forecast for the weekend, but even if we were to make up for what we've lost it would be a little too late for the crops as we are nearing fall harvest time. If you've been up early the past several mornings, you may have noticed a few small areas of thick fog. This morning though the scene is a bit different for most of the area, with a dense fog advisory in place for northern Illinois and southern Wisconsin(with the exception of Jo Daviess county). Visibility this morning has been at a quarter mile to just a few hundred feet. As always, you'll want to flip on your low beams and take is slow as you head out the door. Fog develops with the help of clear evening skies and light winds, those at least are the basic ingredients. But why does it form? Well outside in the atmosphere there are millions of invisible particles and molecules. During warm afternoons those molecules move around very quickly. Because they are moving so quicky, they miss any attraction to other particles in the atmosphere. But as the sun sets and temperatures cool, those particles slowly start to slow down. As this happens, those molecules are attracted to the other particles and attach. The gaseous water molecules will then condense onto the particles, which creates the fog! The name of the temperature at which this occurs is called the dew point temperature! Its a really cool process, but one that causes a lot of headaches for travelers. Some reports state that fog related accidents are the most common weather related traffic accidents.Take is slow this morning! You probably read in the previous post that the start of September was rather cool, and it was! The average temperature was 6.6° below average. But with a changing pattern on the horizon temperatures will get a big boost. Temperatures will be climbing into the 80's today and into the weekend. In fact, in the 7-day, there is only one day below 80°, but every day is above average. The average for this time of year is between about 76° to 78°! So we will be trading in our fall-like feel for another swing of summer into next week! The high temperature in Rockford reached 80 degrees Tuesday - only the second time in the month of September the high has been 80 degrees or warmer. Every other day temperatures have been a little below average - in the mid 70's. While the beginning of the month has started off cool, a pattern change will bring a more summer-like feel to northern Illinois and southern Wisconsin. A strong trough of low pressure will develop in the west this weekend causing the jet stream to buckle a bit more northward over the center of the country. High temperatures heading into the weekend will rise into the low to mid 80's before a brief cold front Sunday cools us down a little for the start of next week. By the middle of next week temperatures will likely return back above average and could very well remain that way through the end of the month. The upcoming pattern change will also bring with it an increased chance for rainfall, which is something much of northern Illinois and southern Wisconsin need. Hurricane Irma broke many records as it moved through the Atlantic and into the southeast United States. If we look at the climatology of hurricanes that typically form that far east in the Atlantic, most of them curve back out to sea and do not have much of an impact on the United States. This is most likely due to them getting caught up within the jet stream and pushed back east. Hurricane Irma, however, did not do that. It continued on its westward track quickly becoming a Category 5 hurricane before reaching South Florida. To understand why this happened, we have to look at what's going on in the atmosphere. When we think about the atmosphere, we have to think of it three dimensionally. As the air warms, it expands and when it cools, it contracts. The atmosphere has different height levels, like floors in a tall building, from the surface to the top. As the atmosphere warms it causes the height levels throughout the atmosphere to rise - allowing high pressure to develop. Examining the height levels at roughly 18,000ft over the Atlantic, meteorologists noticed they've been higher/warmer than normal. The result of this caused a blocking ridge of high pressure to develop which helped steer Hurricane Irma more west, rather than north. Another likely factor for the rapid development of Hurricane Irma are the warm sea surface temperatures over much of the Atlantic. If we look back to sea surface temperatures over the past month, and compare it to what is typically normal for this time of year, we can definitely see a warming trend over the Atlantic and into the Gulf of Mexico. Warm ocean waters are fuel for tropical cyclones, allowing them to continue their development into tropical storms and potentially hurricanes. 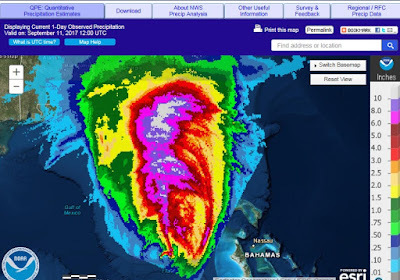 So what can this tell us about hurricanes that form in that area and their potential impacts on the United States in the future? It could actually tell us a lot. There will likely be many studies done to try and understand just how those factors, along with many other, impact the future development of hurricanes. As the climate continues to change and ocean waters continue to warm, we need to understand just what impacts that will have on our weather patterns. While climate change didn't cause Hurricane Harvey and Hurricane Irma, it more than likely had a role in both the strength and overall track of those storms. In the wake Hurricane Irma, many people are still left picking up the pieces. While the eye of Irma moved right up the west coast of the state, the impacts were far reaching. One place hard hit was Jacksonville, Florida in the northeast corner of the state. Multiple convective bands of rain, drawing in an abundance of moisture from the Atlantic, dropped anywhere from three to ten plus inches of rain across the city. The west part of the city received the highest totals. This caused the St. John's river which runs right through downtown Jacksonville to reach record levels and brought FEET of water through downtown streets. Jacksonville Sheriff's office reports they saved over three hundred people. Members of the Florida National Guard even went door to door(in a small boat) to help Jacksonville residents in flooded streets. Irma is now a post-tropical cyclone with sustained winds of only 25mph. Irma's destruction is over, but the system will still drop potentially another 2-4" of rain over areas of the mid-south over the next couple of days. The good news is, the weather pattern over Jacksonville will remain fairly quiet over the next several days allowing residents to clean up. Another Hurricane Brewing In The Atlantic!